It's hard to believe that 30 days have passed. I was sure it would drag out and be miserable. But it turns out that was only the first week and around day 14. This is what many of my breakfasts have looked like over the last 30 days. I agree, it looks good (and tasted good too) but I really have missed my oatmeal. It was tough for the first week or so - cutting everything out and eating only meat, nuts, eggs, good fats, veg and fruit - but after that it was smooth sailing. At day four or five all I wanted to do was eat chips or cookies or muffins or anything really, but I got over it and started drinking tea. The Whole30 is what this eating plan is called. I am not one to diet, never really have, so I look at this as a change of eating habits. I think what made the first week hard was ending sugar - that and the fact that I inherited my father's sweet tooth. Just one cookie, eh? Yeah, right. And one square of chocolate turns into the whole row (you know, those lovely extra large PC dark chocolate bars that I'm talking about). Sugar is in everything. And I mean everything. Even my homemade salsa has sugar in it. So breaking the sugar habit is tougher still because everything has to come from scratch - more work and planning, but in the end, is worth it. This is the Whole30 idea - whole foods. Things that you can just pick up and take a big bite out of. You can't do that with flour, oats or rice, cans of chickpeas - all those things that are up and down the isles in the grocery store. It really has meant just picking up the fresh stuff and enjoying our Trick Farm grass fed beef, Storey humanely raised pork and the Reid farm chicken. Of course, eating like this in the summertime will be even easier - hello garden and farmers' markets! I didn't set out to lose weight (although it would have been reassuring to have lost more than just two pounds), but guess who can button up her snow pants again?? Me!! I'm going to do another 30 days and see if I can tell a change in my nerve pain. That is what I set out to do - and the jury is still out. Well, I wish this was my new home...it's just my virtual new home. If you wish to continue reading my blog please be sure to go to www.juliesawchuk.ca click on the red bell, bottom right-hand side. This way you can see my blog and any other bits of info you would like to know about me. Thanks! Every day in Ontario another person is diagnosed with a spinal cord injury. For some it will be because of a trauma, for others it may even be from violence. Others yet may learn that, because of a tumor or a virus, they may never walk again. It is with this in mind that I am now writing (and have been for several months) a book. It is not a novel or a reflection on my life post collision; it is a resource. Over the past two years I have learned a lot, much of which does not appear in any book or website that I have been able to find. My stack of reference books is growing, but none so far have filled where I see a void. 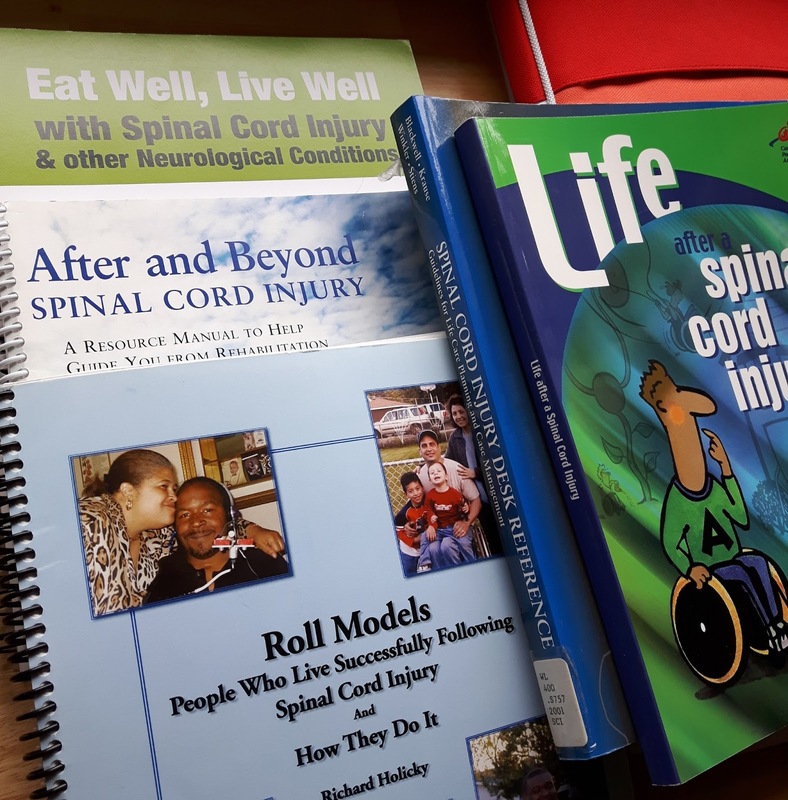 My goal is to get this reference, a "roadmap to recovery", into the hands of anyone who finds themselves in acute care with an SCI. It will guide them through the people and the processes of getting the most out of the systems that are in place to help with recovery. 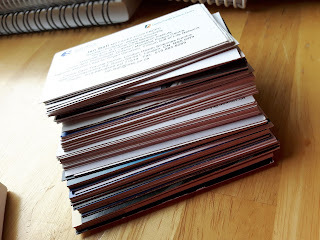 The list of people and places involved is quite long; my stack of cards is still growing. I have a few potential partners for this venture, but nothing sorted out quite yet. I thank Bill and Nikki for the office space - a neutral place to write! This will be my last post on the blogger site. I am changing platforms to wordpress and it will be hosted on my NEW WEBSITE! Thanks to Michele Studhalter, I have this beautiful site - now I just have to learn how to work with it! 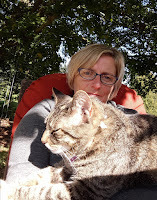 You will be able to continue to receive notifications of new blog posts - visit www.juliesawchuk.ca and click on the red bell at the very bottom right corner of the homepage. You can always click on "contact me" and send me a message too! 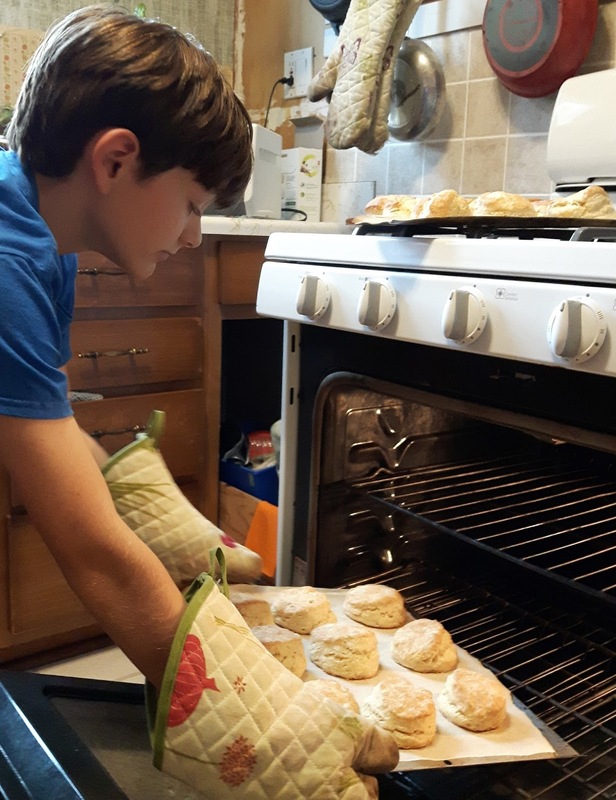 Back in the day, when Theo and I ran a stand at the Blyth Farmers' Market in the early 2000s, I would bake dozens of these biscuits every weekend from May long weekend until Thanksgiving. I can't even count as high as the number of these tasty things that I pumped out of my Tiny Farm Blyth (emphasis on tiny) kitchen. I had that recipe memorized and could make it my sleep - in fact I think that many mornings I was still sleeping when I made them. For the past two years I have had lots of other hands making things in 'my' kitchen. I miss the days of baking, cooking and canning, so this afternoon I had the energy (and lack of nerve pain) to take part in supper prep. These are the result. 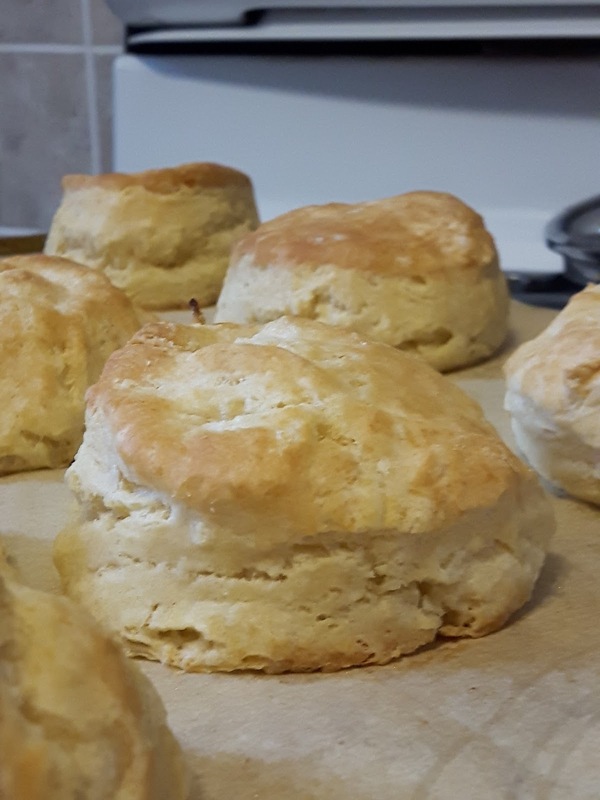 Not bad considering that I made a single batch but doubled the yogurt and had to go back to the lazy susan for more ingredients. So much for my memory. It likely took twice the time it used to, I suppose as I practice more I will get faster. Although I have more core strength than I did two years ago [came home two years ago this weekend] I don't have enough to work with both arms in front of me. One arm (usually my left) is needed to keep me from falling forward into what ever I have in front of me (picture my: laptop, plate of food, cutting board, mixing bowl) cutting up meat on my plate is quite a workout. My body is so off balance that my muscles and spine often protest. The other consideration is safety. I also do not possess the core strength required to reach into the oven and pull out something hot, and one arm is not strong enough (unless they were meringues). Burns are highly likely and quite dangerous considering the fact that I may not even feel that I had one. So I get my helpers involved - but of course they are not always around. This leads me to our new house. I have plans for a wall oven with a door that swings to the side which should make getting hot stuff out a bit easier (and safer). We will also have a cooktop that is lower than that of a regular stove so I will be able to see in the pot rather than having to lower the pot to look inside (or use a mirror that fogs up). Now if only the kitchen fairies would come and clean up the mess I made...wait a minute, isn't that why we had kids? I just had a call from my doctor. He was following up on a test I had done last week on Friday - the results were negative. This, from a health perspective, is a good thing. But it sure is not helping me otherwise. What it means is that I don't have another UTI even though all signs would point in that direction - especially today when my nerve pain is off the charts. me finish the 38.5km 4.5 hour ride in Hamilton. for always having my back. that we attended on Friday. I got up to see the kids off to school, had breakfast, checked my email and that was it - all I could manage. So I went back to bed, slept on and off until about 1:30. Theo checked in on me every so often reminding me that rest was good - it'd been a hell of a busy month. He brought me a cappuccino and I cancelled all my events for the day: physio, a meeting for accessibility and a social. I asked my doctor "if there is no infection, then why the all symptoms?" He didn't have an answer; that's the thing about nerve pain - no one really has an answer. He asked me if I had been over doing things to which I sheepishly responded "maybe". I said "that is what October is for...rest". He asked if I had a measurable goal for resting this month. I guess I need to make some plans of a different sort. I honestly don't know how to do that. How to say no. Elaine says that she is going to give me some lessons - but how to I say no to speaking? to helping the county become more accessible? to my family? to my friends? Me and my mini-me, Anne, standing in the Exo. Last week, for example, I thought would be quieter because the IPM was over. 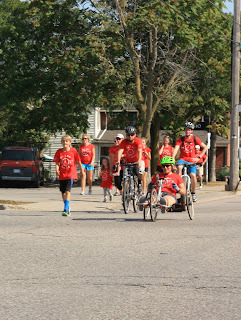 But we did Greg's ride (38.5 km in the heat on Sunday) I had two appointments, went to London to walk in the Exo (and interviewed two people for my book) and we went to Toronto on Friday to the swimming finals for the Invictus Games (saw Prince Harry and shook the hand of The Honourable David Onley former Lieutenant Governor of Ontario). Plus we had David and Anne for the week. How could I say no to any of that? The part that really bothers me is that I had to cancel my physio appointment for today. That is the most important thing that I do right now - that is my work! I just called in sick to work - which I almost never did before. And the irony of it all is that I just wrote another column for The Citizen entitled "No Limits, No Excuses". How does anyone ever achieve "work-life balance"? 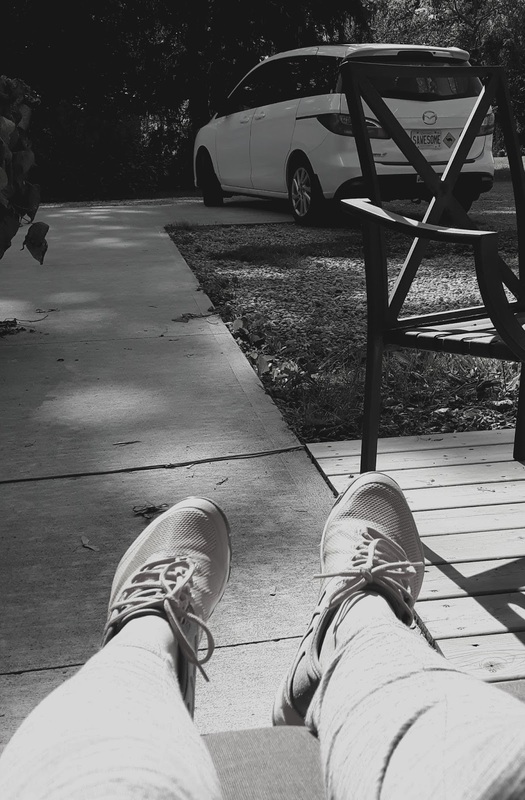 Take a deep breath, enjoy the fall sunshine and relax. Perhaps when the cat comes and sits on top of me I should just listen to her say "you are going nowhere". I guess SAWESOME and I will stay put today and my "big plans" will be to pick Oliver up from the end of the driveway. Aka International Plowing Match 2017 in Walton, Ontario. It's probably not the best idea for me to spend the afternoon in the sun and heat and then come home and drink a cider...but I did anyway. Holy cow what a hot day. But the week didn't start that way... this is what it looked like. And besides, I have been making myself useful. 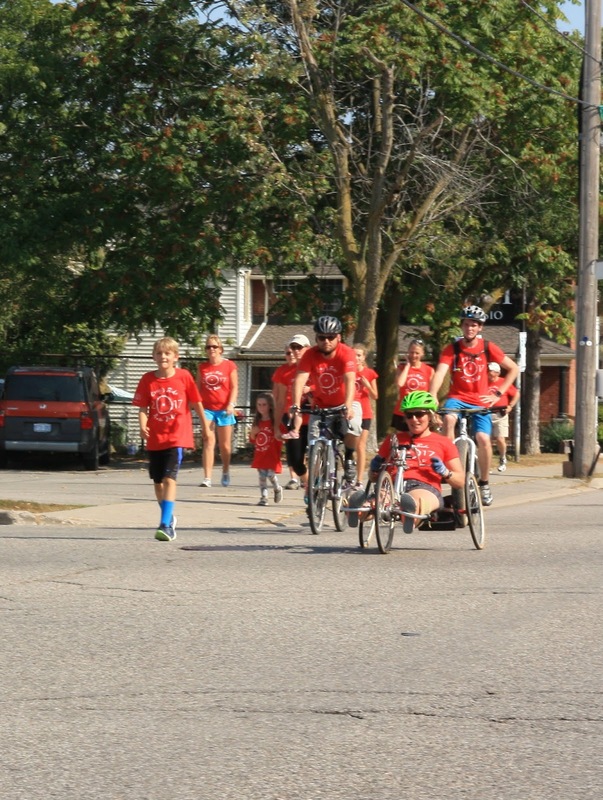 I joined the IPM 2017 Accessibility Committee several months ago and have been working with a keen group of women (yes, all women) on this project ever since. We have had a lot of support from the local IPM committee and from businesses keen to have the accessibility features on site. The brains behind the operation, Charleen O'Rilley, collected a diverse group of people with various experiences and expertise in living in an inaccessible world. It's true, if you don't live it, you don't know it. There has been lots of publicity about the work that has gone into making this match accessible, in fact it was the topic of my last column in The Blyth Citizen. That, and Scott Miller, CTV did a great story to help spread the word too. It's working. We (the committee) have had a huge response. People have come to the match that have not been able to for years. 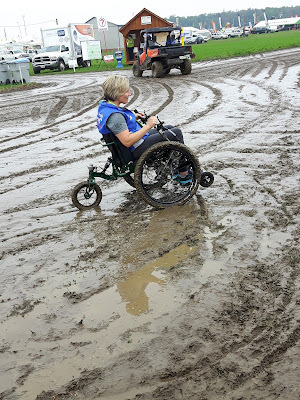 Planning a day at an outdoor event, knowing (because you saw it on video) what the bathroom facilities are going to be like for [insert the person who needs an accessible washroom here] makes a world of difference. Scooter rentals, ramped wagons, GOOD accessible parking, it all adds up to a day where all you have to worry about is the weather. Which was indeed a worry. But the match organizers closed the tented city down for the day on Wednesday so they could help preserve the land, and let it dry up a bit. Today we saw corn husks, mulch and wood shavings all being used to help soak up the water that fell from the sky all day Monday and Tuesday. I spent some time talking to visitors on Tuesday and had the afternoon as a visitor with my family today. What a difference a few small changes make! Ramps to stages, large private bathrooms, viewing areas at concerts and events marked out for people to roll up with their scooter or wheelchair. The ramp up to the stage in the RV Park meant that one girl who uses a wheelchair was able to join her choir up on the stage as they sang during the worship service. The accessible parking area has a drop off zone and a ramped wagon to take you back to your car if you need it. Although we didn't stop to eat I talked to people who made good use of the picnic tables that have open ends to wheel up to. And, for the first time ever, people could tour the plowing fields on an accessible wagon thanks to the Townsend Family. The most fascinating part is how word spread. Scott Miller's video has over 30,000 views - a lot from people sharing it with those who would benefit from knowing - often changing minds and deciding to attend. And word didn't just spread via YouTube, it also spread by word of mouth around the match during setup. 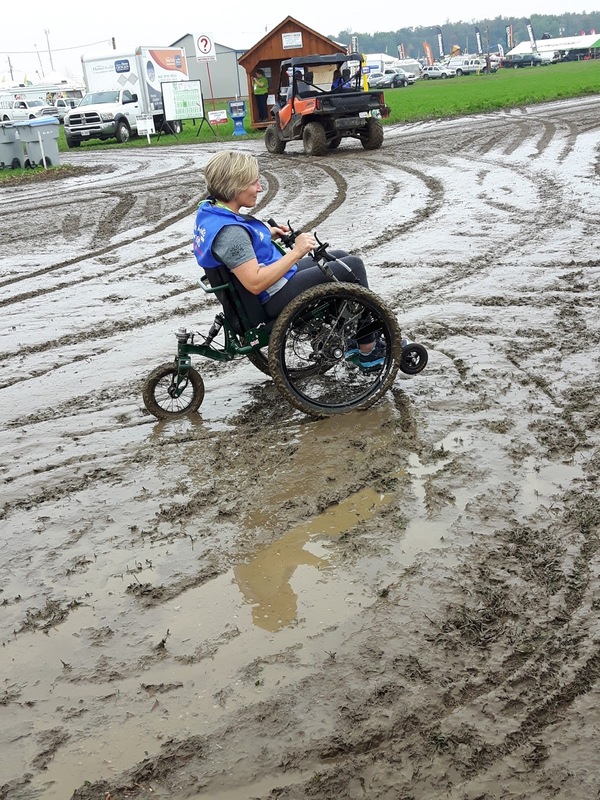 Poor Charlene was getting calls and texts at all hours - staff who were setting up their tents and exhibits wanting to know what was best for accessibility purposes - which of course was a good thing. I feel like this could be a new beginning - one where the people who run outdoor venues will begin to understand that setting up to create access for all just makes sense. 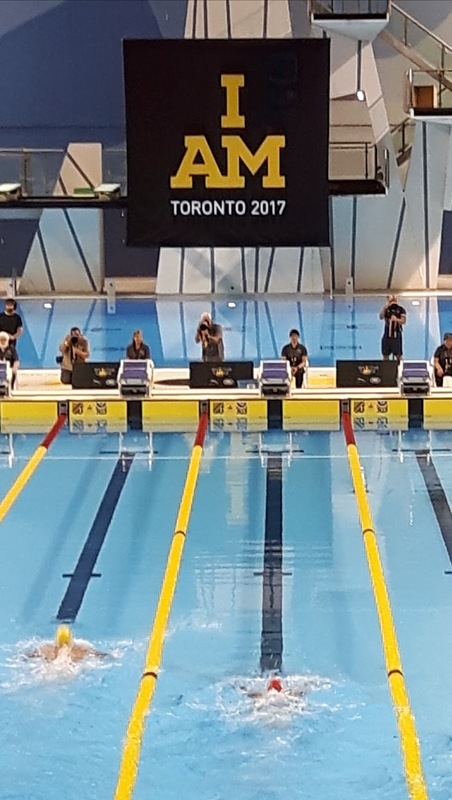 I heard Rick Hansen speak on CBC yesterday - 30 years ago he finished his roll around the world to raise awareness for people with disabilities and today marks the opening ceremonies for the 2017 Invictus Games in Toronto. All of these things coming together at the same time will help everyone understand that not everyone can walk up steps...but a ramp means access for all.